The small independent fragrance company Scentings recently expanded its line of literary-inspired scents; now, in addition to perfume oils named after Jane Austen heroines Elizabeth Bennet and Emma Woodhouse, Scentings represents the mystery genre with Miss Marple and Nancy Drew. I still remember the very first time I read a Miss Marple mystery: it was The Mirror Crack'd, and it was the first Agatha Christie book, even the first "grown-up" mystery, that I'd ever read. I was eleven years old, and it was a gift from a teacher; I was thrilled by it. Years later, having read many more Christie mysteries, I savored every episode of the BBC Miss Marple series starring the peerless Joan Hickson. That series was unimpeachably faithful to the books and to the character of Miss Marple. Scentings is just as faithful to Christie's creation, in its own way: Miss Marple really does seem like a perfume that the legendary crime-solver might have worn. It's "a remarkably vintage floral blend" with notes of "antique lilac and lavender" and a "clean, light, classic" feel. That description is just right. Miss Marple is simple, yet complete: the herbaceous, slightly greenish lavender is balanced by the sweeter, almost powdery lilac note. Miss Marple does feel old-fashioned, in the nicest way, yet it's not at all dusty or musty. I can imagine can imagine Jane Marple buying a fragrance like this from some traditional British company like Yardley of London. Nancy Drew, unlike Christie's delightfully consistent Miss Marple, is a character who has undergone a number of metamorphoses over her lifetime, from her changing appearance in the books' cover art to her behavior and manner of speaking in the text to her "rediscovery" as a feminist icon. Although I did read a number of Nancy Drew mysteries, I never grew as attached to them as I did to the Miss Marple stories. I was always slightly uneasy around Nancy, or rather, uneasy about the way her personality (and even her looks) seemed to shift over the series' decades of titles and the ever-changing roster of "Carolyn Keene" ghost-writers. What perfume would this girl sleuth wear? That would depend on the particular mystery and the year in which it was written; the Nancy of the 1940s (something from Coty?) probably wouldn't smell like the Nancy of the 1980s (Ralph Lauren's Lauren? ), for example. Scentings' Nancy Drew is a "crisp, sugary, light" scent with notes of vanilla absolute, Key lime, lemon, clementine, and lilac. I'd call this a perfect "summer vanilla," since its sugar-cookie heart is offset by the bright citrus notes. I can't way exactly when or where Nancy Drew would wear this fragrance, but it's a light-hearted blend that has good staying power without feeling too overwhelmingly gourmand. It would be ideal for a teenager, or even a younger girl just starting to love mysteries. 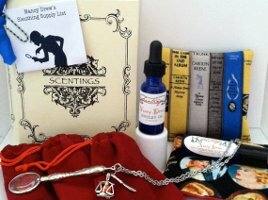 Scentings Miss Marple and Nancy Drew are packaged as multi-product sets ($45). 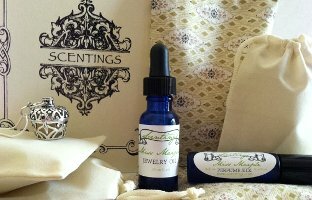 Each set includes a 10 ml bottle of Perfume Silk, a 10 ml dropper bottle of Jewelry Oil with two limestone beads for scenting, a silver-plated charm necklace to hold the beads, and a pair of lavender sachets. The "aroma charm" for Miss Marple resembles a little silver knitting basket, and the necklace for Nancy Drew includes a magnifying glass, a tiny dagger charm, and an "aroma charm" shaped like the scales of Justice! The Jewelry Oil is also sold separately ($19). More information is available at the Scentings website. this is a compelling idea, but darn, I envisioned Nancy Drew as a chypre wearer! hah! Me, too… or something citrusy on warm days. Maybe her style has changed over the years! I imagine Nancy wearing Eau Sauvage and driving her little red car. Thank you for a fun, lovely review, Jessica! I absolutely adore Joan Hickson’s Miss Marple (I own all of them and watch them a shameful number of times). Even though I know it’s impossible time-wise for her to have worn it, I always associate PdE Eau Suave with Miss Marple. Redolent of the garden, clean enough to avoid unwanted attention but with a hint of subversive chypre. But I understand what they were going for with this fragrance and it sounds nice! I’ve never been a Nancy Drew fan, but I highly recommend “Girl Sleuth: Nancy Drew and the Woman Who Created Her.” Such an interesting book about the many amazing female ghost-writers. Thanks for the book recommendation, Betty! I think I’d enjoy knowing more about that aspect of Nancy Drew. And I like that Eau Suave idea! Oh, Eau Suave for Miss Marple would be just perfect! I agree completely! Love Eau Suave. The thing about Miss Marple of course is that despite her age she is mentally so vigorous. She outsmarts men all the time. She know how to look life in the face and I don’t think she is sentimental. All of that come across in ES. Like all chypres, ES is an intelligent fragrance. Oddly enough, in the early Miss M. stories, The Thirteen Problems, she seems very old indeed. As Christie developed the character she seems to have decided to make her a bit younger. I already have the Elizabeth Bennet set from Scentings, and I can report that it is very well done. The scent charm necklace is beautifully finished and Ia nice size, about 1″ in diameter. I mention this because I have come across other “perfume necklaces” that were not so nice–rough edges, bare spots in the silver plating, too small to make a nice pendant, and so forth. There is none of that here. Even without the scent, it would make a nice piece of jewelry. The packaging is exquisite, as well, and it would make a very nice gift. I just placed an order for the Miss Marple set, as well as for the Emma Woodhouse set, which is back in stock (it was sold out a while back). BTW, everything in the Etsy shop is currently 20% off, so that makes the price of the set only $36, quite a bargain! I’m definitely an Agatha Christie fan; I have read all of her mystery novels and all of her short stories, or at least as many as have been published in the US, and I adore Miss Marple. I have not seen the BBC series, although I have heard many good things about it. I just don’t watch much television, and I usually find film or TV adaptations of Christie works to not quite measure up to the written versions, at least in my judgment. I think that when I read a story, I get a definite mental impression of the characters, places, etc., and then when I see it on the screen, there is always something “wrong”, i.e., it is not the way I pictured it. 50_Roses, I know what you mean about people/places/things not looking “right” in television or film adaptations! This series was one of the few that didn’t disappoint me. I agree that these scents are nicely done and that the presentation really is lovely. Perfect gifts for fragrance/book lovers, or just for oneself! I have never read anything with Nancy Drew. Christie however I’ve read extensively. I love the Hickson adaptations and I think that A Murder is Announced is probably my favourite. The fragrance sounds just what she would choose for herself. I can also see her in something by Chanel, as they tend to wear quite lightly. I can’t really enjoy that more recent Miss Marple series… the woman playing Miss Marple is a little too cutesy and knowing, and the writing makes too many changes to the stories! But Joan Hickson was perfect, and those adaptations seems very faithful to me. “A Murder is Announced”… I think I remember that one. With “Pip and Emma,” right? I had such a crush on that young male actor! Yes that is the one! I liked the inspector. It also features a very young Kevin Whately who would later rise to fame as Morse’s sidekick, Lewis. Ironically he is a sergeant in this Marple story as well. I read all the Nancy Drew books when I was in high school (way back in the last century). In those days, drug store perfumes included a full range of Guerlain EdC in the clock bottles plus Coty and Dana. I tend to think Nancy would have worn Dana Canoe, but there were many great options in those daysand I wouldn’t rule out any of them (except Tabu and probably Shalimar). At the time, I actually preferred the Judy Bolton mysteries. She seemed more real, somehow. Ooh, I wish I could find these here in Prague! I’d buy Miss Marple on the spot, it has the exact notes I would imagine she’d like. Hope they develop a Jessica Fletcher one too! And an Eliza Bennett! While creating the scent I did in fact have young girls in mind and kept seeing Nancy relaxing and smiling with her friends! I wanted the scent to show the lighter-girlie side of Nancy… A scene from one book which has her enjoying taffy pulls with her best friends filled my head with vanilla-taffy-citrus goodness… and there you are!! I think Nancy would want her scent to be “unexpected” and one that could help center her in times of peril! Hope this explains a bit more, and thank you again for all the kind words! !